US, 1996, 109 minutes, Colour. Charlie Sheen, Ron Silver, Lindsay Crouse, Teri Polo. Directed by David N. Twohy. The Arrival is a variation on The Invasion of the Body Snatchers theme - with an update to astronomers with advanced technology. It also anticipated slightly the very successful 1996 film, Independence Day. 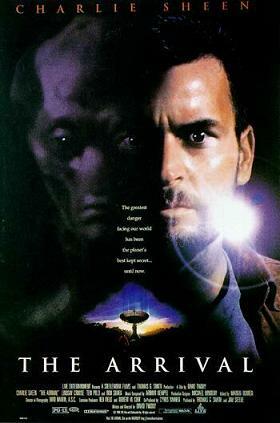 Charlie Sheen brings a serious intensity to his role as the astronomer who discovers the presence of the aliens. He is so intense that he erupts angrily and seems generally petulant. Lindsay Krause is a scientist. Ron Silver does his variation on the villain theme (as in Blue Steel or, similar to this film, Lifepod). There are special effects, a great deal of action and chases with a final confrontation on a dish which enabled the scientists to discover the presence of the aliens. There is also a twist at the end where audiences are expecting Sheen's girlfriend to be the alien whereas it is the friendly black American boy! 1. The popularity of this kind of science fiction? Life in the galaxies? Close encounters? Friendly, hostile? The tradition of the Invaders from Mars and The Invasion of the Body Snatchers? 2. The desert locations? The Mexican locations? The special effects - especially for the confrontations with the aliens? The science and technology background? The musical score? 3. The title and its focus on the aliens, their mission, their discovery, their goals? 4. Zane and his associate? Their work as astronomers? Technical and scientific knowledge and skills? Their discovery of the aliens? Reporting to the superior - and his ignoring their information? Zane's confrontation with him during the lecture and his dismissal of the attack? The back-up system? His friend and the interrogation by Security, the taking away of the tapes - and his telling the truth about the back-up? His later death? 5. Zane as a man with a mission? His relationship with Char - and her ambitions and his resentment? His confrontation with her? His going to his home, his buying up all the technical equipment, setting it up in the house? The interactions with Kiki, hostility, friendliness? Kiki and his being part of the experimentation? The contact with the dishes - and the reproduction of the message? The discovery of the Mexican radio? 6. Zane and his going to Mexico? His encounter with the scientist and her information? The collaboration - the time in the city, socialising? The man following Zane - and his pursuit of him, through the procession, the man leaping into the air? The meeting with the scientist - and the Security taking her equipment, interning them, the questions? Her later death? 7. Zane and in ingenuity, going into the property, discovering the truth? The investigations about the equipment? The experiments with power? The discussions with the head of the police - his confrontation with the aliens, the fight, their death - and the death of the scientist? His escape in the bus? 8. His escape, pursuit, return to the United States, the confrontation of his superior and revealing that he knew the truth because of the similarly-faced policeman in Mexico? Reuniting with Kiki? The discovery that his house had been cleaned out? The plan for confronting the aliens? His relying on Kiki? The arrival of Char - and his suspicions? Their going to the tower? The set-up, the attack of the aliens disguised as gardeners? Having to trust Char, asking Kiki to press the button? His driving, the pursuit, setting up the dishes? Discovering that Kiki was an alien? The metal ball and the destruction within the centre? Char and her escape onto the dish, Zane and his pursuit? The freezing of the aliens - and his getting the information from the frozen superior? 9. The background of science, the aliens and their warming the earth, the background of global warming and the information on the television? The scientist and her experiments? The acceleration of the heating? The aliens and their infiltration: into scientific centres, the gardeners and their role as security and murderers, Kiki and his being a spy? 10. The defeat of the aliens, Zane's final message to Kiki - and the warning against the aliens? 11. The plausibility of this kind of plot, characters? The credibility of the science and technology? Science fiction and its role in telling story fables that warn people about the excessive advances of science?